Door Popper kit for any car. Convert any of your manual boot release to electric release with this kit. A basic and easy mod to any car! Great and easy add-on to alarms with extra channels and can be used with our central locking upgrade kits. Solenoid connects to the existing boot latch or release cable. Comes with mounting bracket, Solenoid kit and In Dash Button. Control from the dash push button supplied or connect to suitable alarm system if they have a spare channel. With the boot lid open, turn the key and examine the lock action. Attach the mechanical linkage to the lever. Mount the solenoid in a position to allow the cable to attach to the mechanical linkage with the cable pulled out to maximum length. Ensure the solenoid is mounted parallel to the lever. Ensure the cable will run freely without rubbing on any surfaces. Attach cable to mechanical linkage. Remove slack before tightening nut/bolt. Connect wiring as per diagram above. Ultimate car parts have been in the motor trade for over 16 years and are now importing quality car parts for you to upgrade your car at sensible prices. A VAT invoice can be provided upon request. We recommend that if you are unsure about installation please contact a professional auto electrician for advice. All modifications should be undertaken by a certified technician and we accept no responsibility for any damage to kit or car while the kit is been installed. 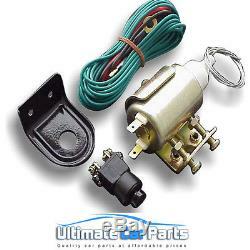 The item "Door or Boot Trunk Popper Opener Solenoid Kit Suitable For de Locking Your Car" is in sale since Friday, October 14, 2011. This item is in the category "Vehicle Parts & Accessories\Car Tuning & Styling\Interior Styling\Door Handles, Locks & Pins". The seller is "ultimatecarparts1" and is located in Blackpool. This item can be shipped worldwide.